Volkswagen is catching up to the rest of the automotive-dom in the realm of EVs or Electric Vehicles. At the Consumer Electronics Show (CES) in Las Vegas, the German automaker showed off a new concept riding on the company’s Modular Electric Drive Kit (MEB). 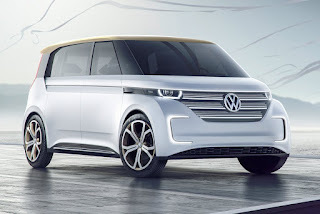 The Volkswagen BUDD-e is an all-wheel drive MPV that’s a modern interpretation of the original bus (Type 2). It can run 533 kilometers or 233 miles on a single charge while still having a total power output of 317 horsepower. What’s even better, the BUDD-e’s batteries are all located in the vehicle floor, not intruding into the interior or luggage space. What’s more, the battery can be charged to 80 percent capacity within just 30 minutes. The MEB platform is also highly flexible and can allow Volkswagen to design a family of EVs in the near future. ^This should have a defeat mechanism to save on electric bills when charging! Good luck VW!